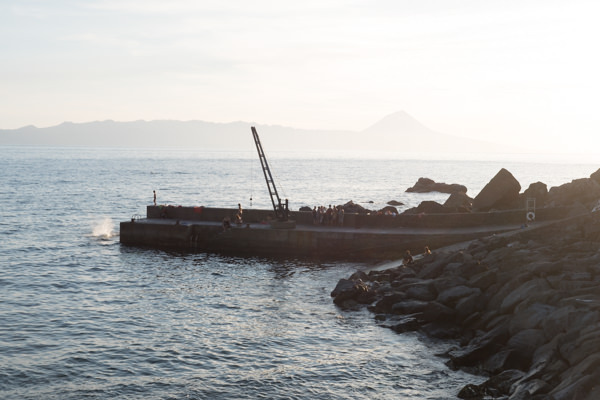 When I first hopped around the Azores islands two years ago, at one point I inquisitively pointed at the island of São Jorge, which was visible just across the water from Pico. “Oh, São Jorge? I guess that island has potential,” my guide said. I didn’t really go there either, as I was on a fixed itinerary. But my curiosity was definitely piqued. 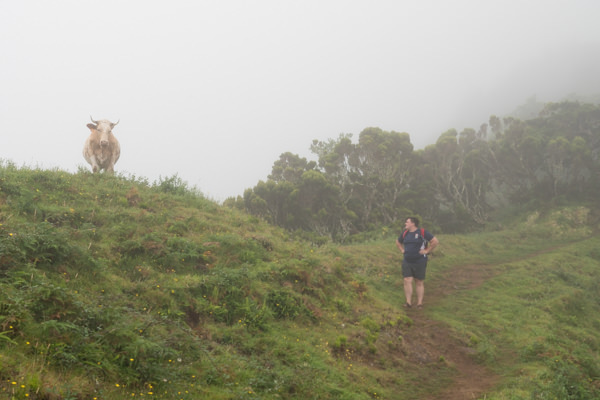 It had felt like my guide was almost suspiciously casual in describing São Jorge, and I wanted to see it for myself. 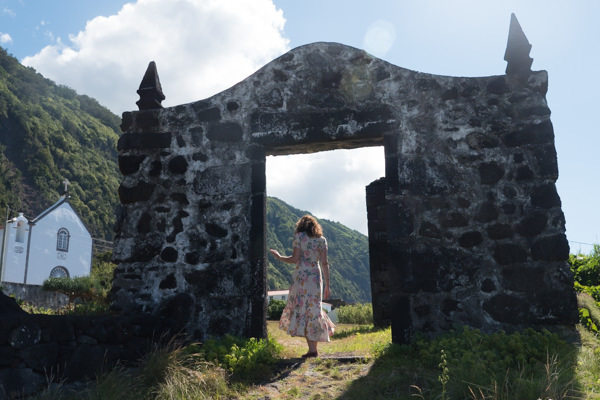 On my second trip to Azores, I had the chance to finally visit São Jorge. And guess what? It became an instant favorite of mine. 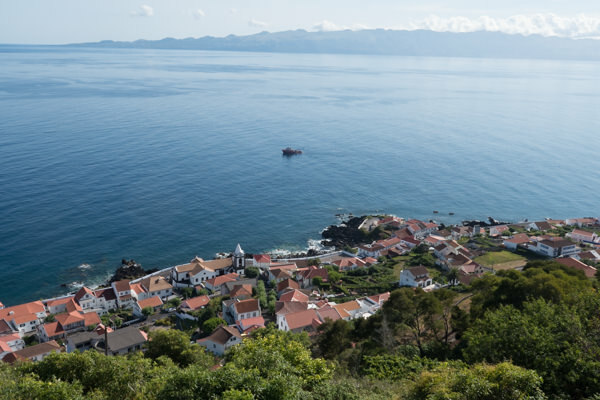 As you approach the port of Velas by ferry, you’ll notice immediately how São Jorge’s rugged and jagged coastline rises sharply from the ocean. A central mountain range runs along almost the entire length of the island, forming more or less a plateau from which there are big elevation drops down to the shore. 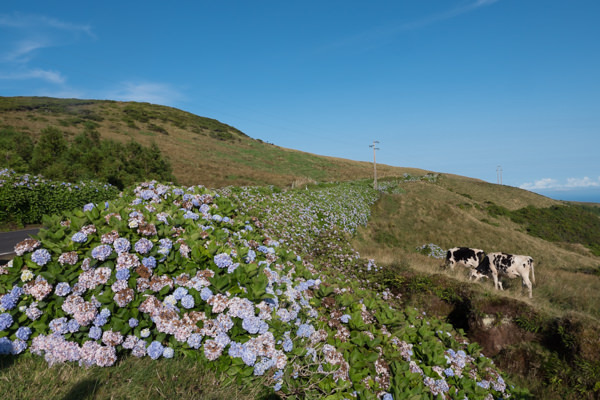 This is part of what makes São Jorge one of the most beautiful islands on the Azores. 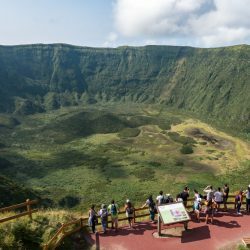 Dotted at sea level at the base of the cliffs you’ll find many so-called fajãs, which are small plains once formed by lava flows or landslides. 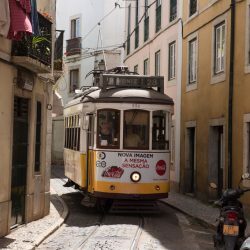 Many of these fajãs are home to tiny villages, some connected by windy roads and some reached only by foot. 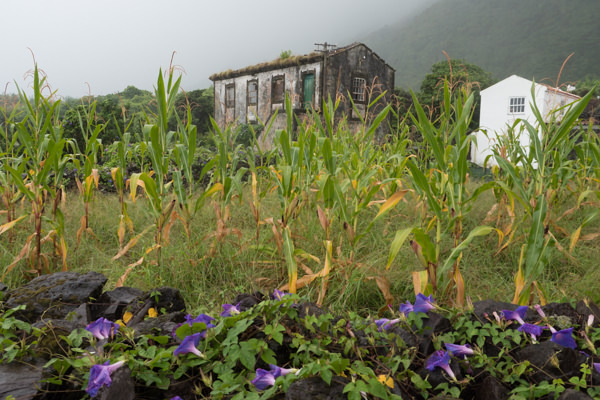 There are over 40 of these fajãs around São Jorge. It’s a joy to go down to some of these and then grab some seafood or take a swim. 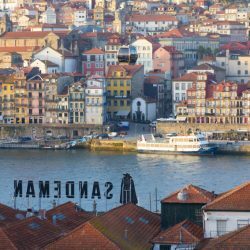 I spent a day driving around and visiting the fajãs and villages, driving along windy roads lined with rows of blue hortensias. Down in the fajã de São João, a town with just 7 (yes, 7!) 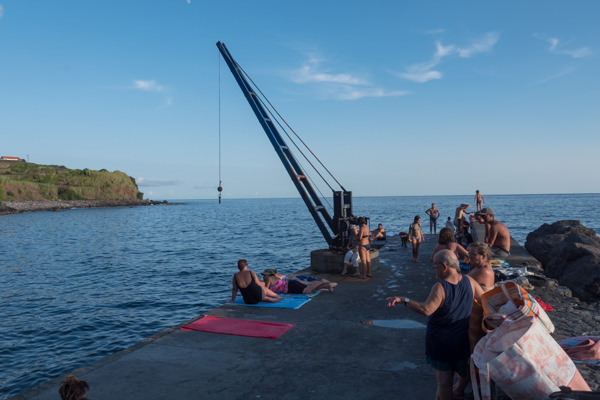 inhabitants, we jumped off the fishermen’s docks into the sea. In August, the waters had just the perfect temperature. While enjoying a refreshing dive and beautiful views of the shore, a scuba diver suddenly appeared out of nowhere. 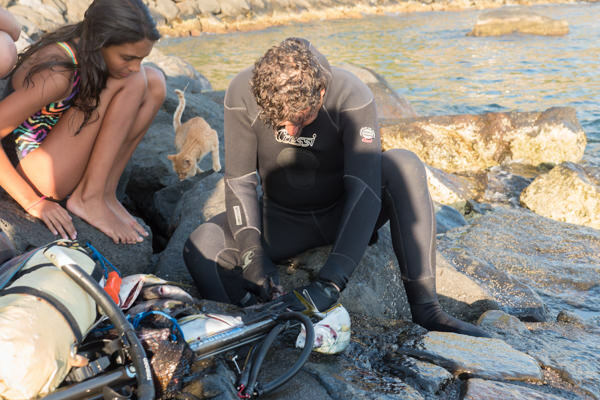 He swam to shore carrying a speargun and promptly began filleting some fish he’d caught under the watchful eyes of a village cat and a few curious children. 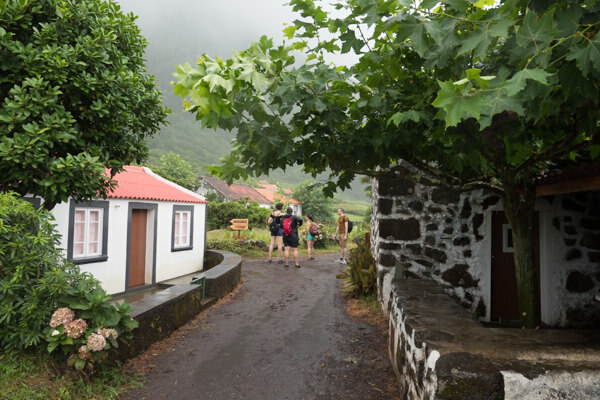 São Jorge is a tranquil and rural place, where little stands out apart from the little churches and lighthouses. It’s quite low-key and a joy to explore. 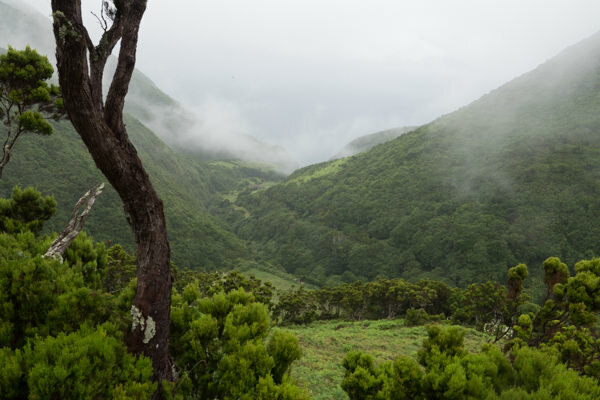 My second day on São Jorge was dedicated to hiking the trail of Caldeira de Santo Cristo. 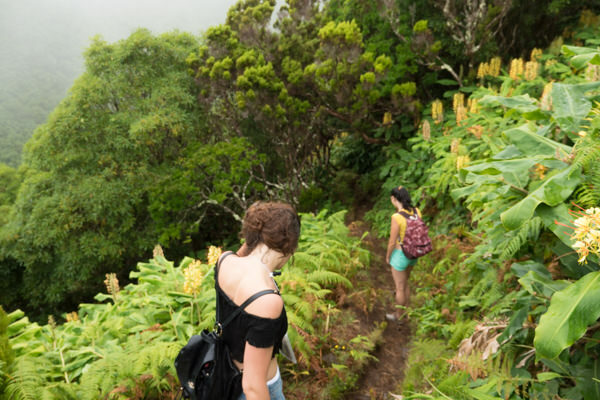 This hiking trail begins on the mountain rim and goes down for about 3 hours to several fajãs, ending in Fajã dos Cubres. 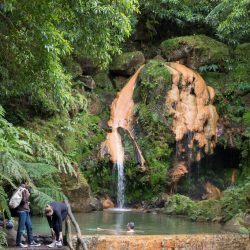 (You can see the trail here on wikiloc or on Visitazores). It’s probably a testament to the sheer beauty of this island that I still consider it one of the best hikes I’ve done in a long time — despite rain pouring down and clouds obscuring some of the best views. I loved the variety of landscape and fauna. The path first zig-zags past cow pastures and small forests filled with blue hortensias, juniper bushes, and tons of yellow ginger-lilies. 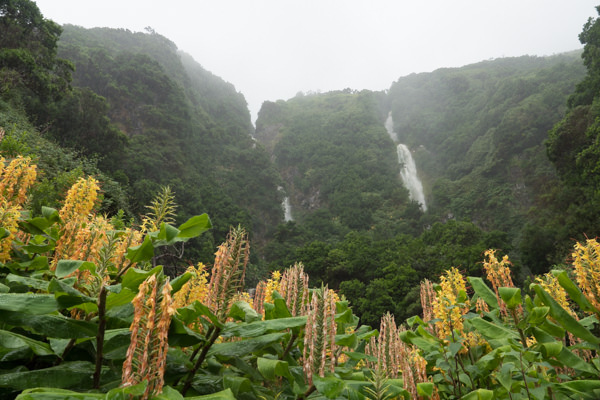 It then continues through a lush green valley and past several waterfalls. 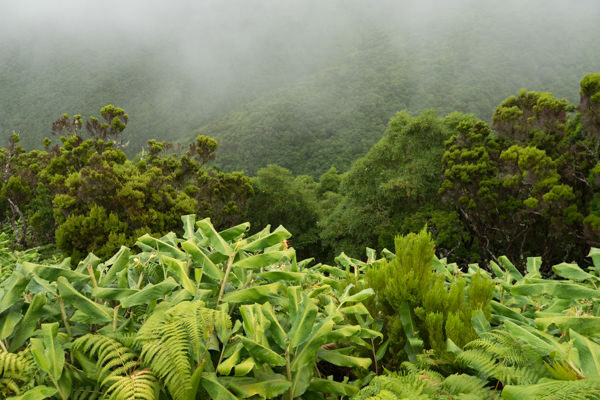 The plants and trees are quite varied on the Azores and can even look tropical at times. 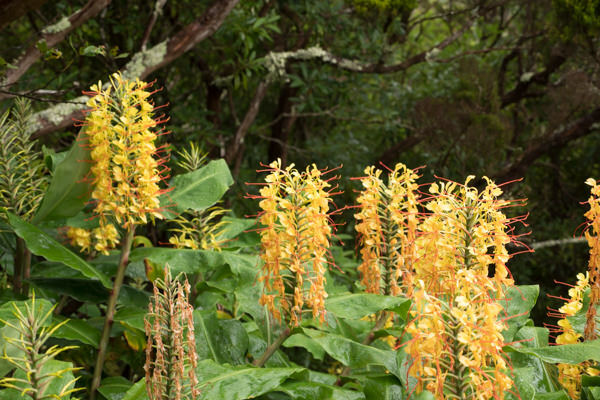 This is because of its varied climate but also because of the Azores’ position along historical trade routes; for instance, all those yellow ginger-lilies originally come from India and Nepal. They’re now considered an invasive species, but I can’t say they’ve made these trails any less pretty. 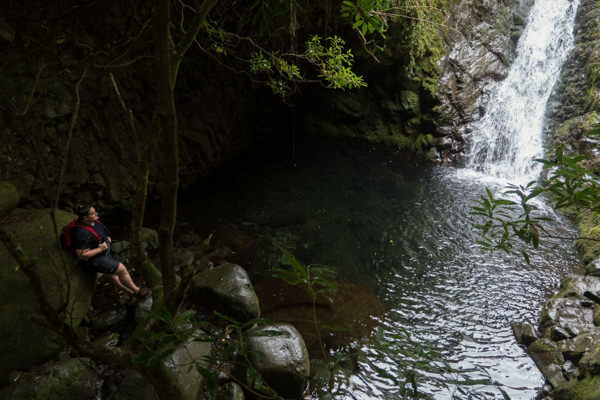 We went for a swim at one of the waterfalls. The rain didn’t make this as refreshing as it maybe could have been, but it was a beautiful spot for a swim or a dive. 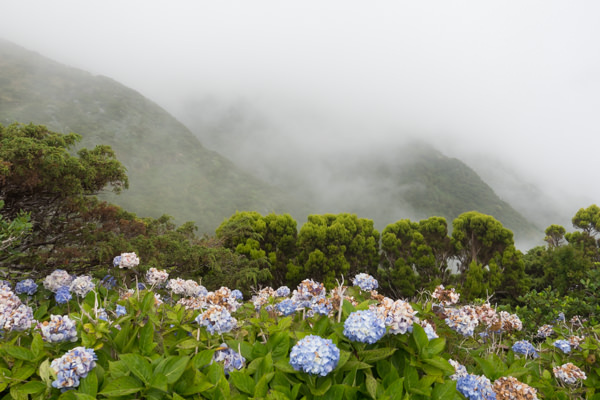 Soon after the forest opened up to reveal the coastal cliffs and the first fajã off in the distance. 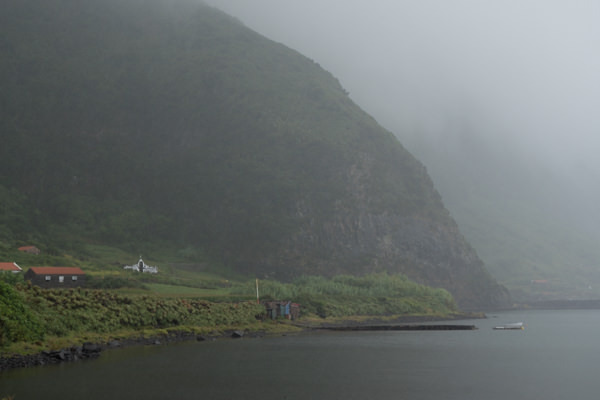 It seemed to be mostly fishermen and subsistence farmers living around these parts. Some of the fajã are even totally cut off from any roads, so locals drive between them on dirt paths using small ATVs. We passed a few more gorgeous waterfalls, which due to the rain had flooded the road and required us to walk through running water. It added a minor element of adventure during the final hour of the trek. 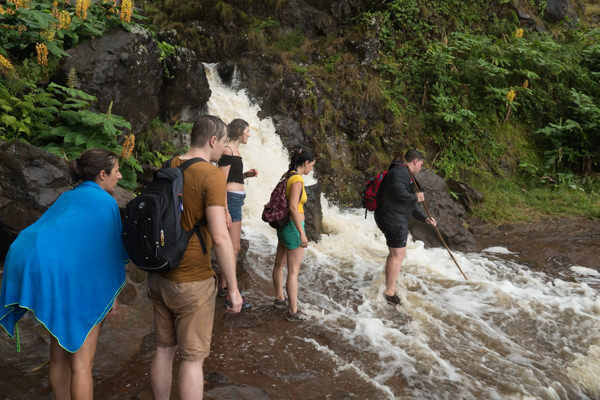 But completely soaking our shoes was all worth it, and at the trail’s end we warmed up our bodies in a tavern with some stiff shots of local aguardiente. 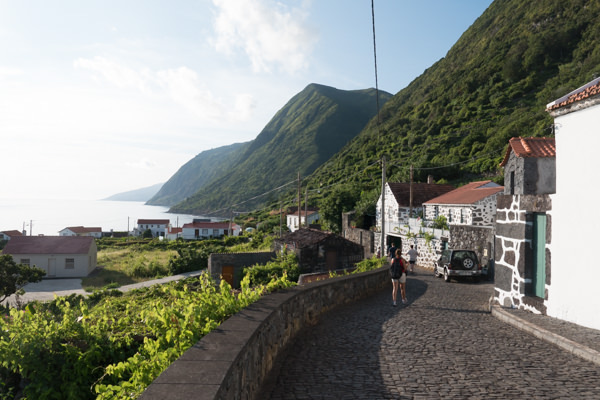 São Jorge doesn’t have quite as many tourist facilities, museums, or restaurants as some of the other islands. At the same time, it also is one of the greenest, most scenic, and for me most memorable islands of the archipelago. 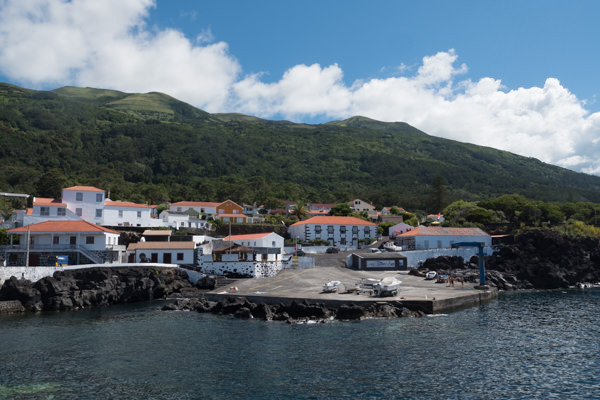 If you’ve come to the Azores to see charming villages and beautiful nature, then São Jorge is the island to visit. It shouldn’t be too difficult to find cafes or restaurants in the main port town of Velas. But in the smaller villages, you might be out of luck occasionally. 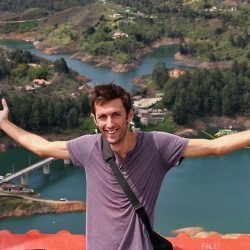 Me and my friends stayed in an Airbnb in the town of Calheta, and the only restaurant normally closes its kitchen at 9pm, while the only lunch available was hotdogs or burgers at the supermarket. A restaurant at the lighthouse was unexpectedly closed, forcing us to find another place to eat. 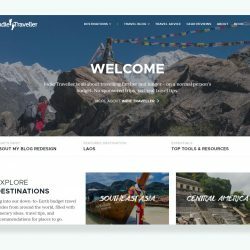 It’s obviously not a big problem, but sometimes you might just have to drive around a bit, or it could be easier to prepare food at your accommodation. If you’re on São Jorge, you should definitely try the São Jorge cheese. This soft cheese is famous all over Portugal, and is usually served with some bread and delicious spicy pepper sauce. You can get this as a starter or couvert before your meal. For a slightly pricer but nice meal, I can recommend the Fornos de Lava restaurant. 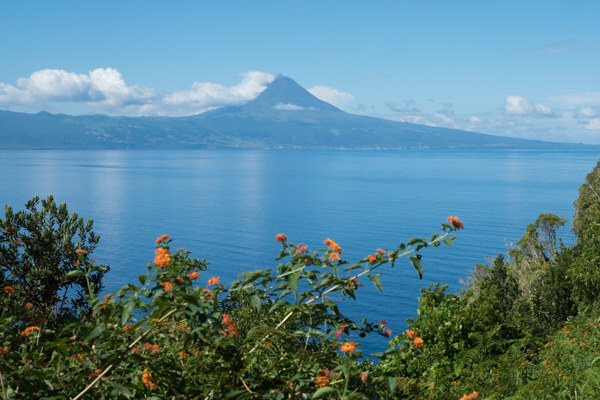 It also offers some panoramic views with Mount Pico off the distance. 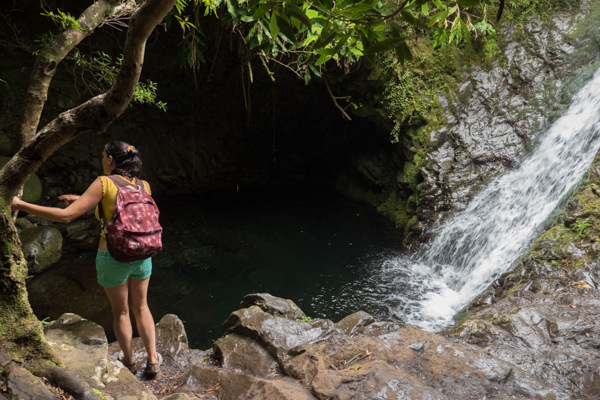 If you want to explore São Jorge, you pretty much have to rent your own vehicle. We got our cars at a rental in Velas, which cost about 20 EUR a day. 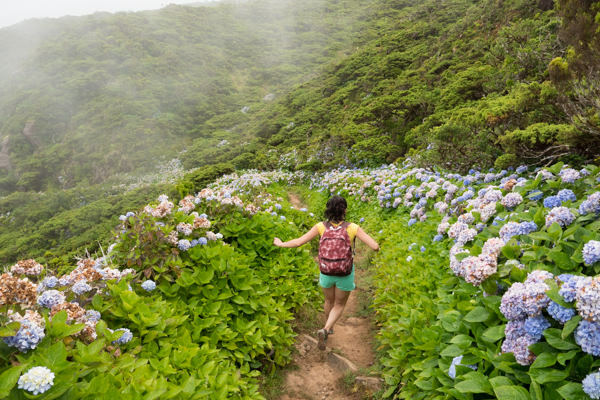 For more on the Azores, check out my guide to the islands, and my story on the wonderful island of Pico (which combines well with Sao Jorge). Oh wow, I’ve never heard of São Jorge Island before so I am glad I read your post. It looks completely calm and beautiful! 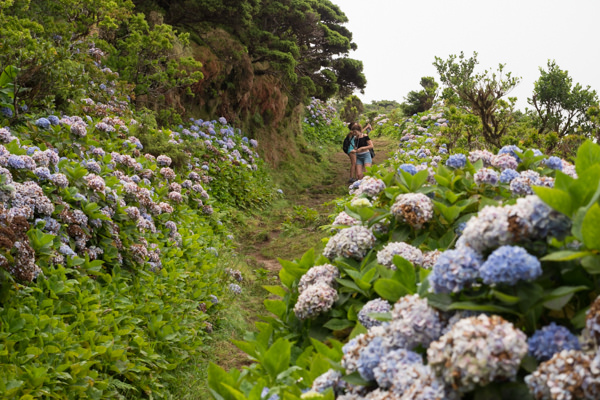 Isn’t it a shame that the flowers that make the path so beautiful are an invasive species!